Great news! I've joined the DT at City Crafter! Our challenge this week is : Let's Go Nautical. 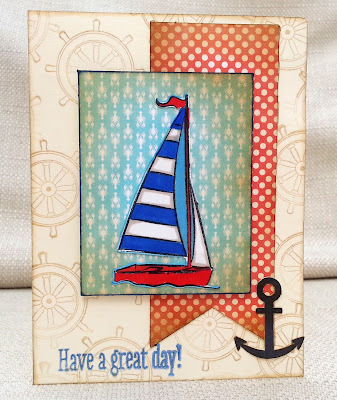 I made a stepper card using my Silhouette electronic cutting machine, ( the boat is a Silhouette file, the lighthouse one I traced myself) , Sizzix die (waves) , Woodware stamp set (sentiment and seagull) and Tilda papers. I hope you'll come and join in at City Crafter - please do pop over to see what the DT have made, especially our guest designer, Judith. I chose this week's theme at Make My Monday - normally when I set a challenge I play along with everyone else - set theme first, get idea afterwards. 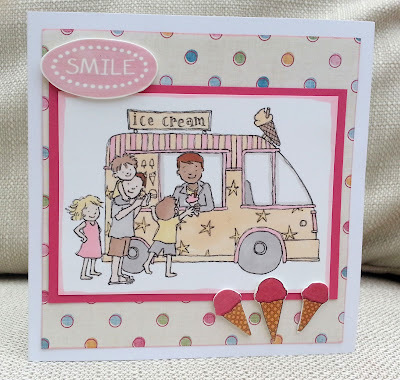 But this time, I had a cunning plan all along to use this ice-cream van digi from JellyPark. I coloured it with Promarkers and made the embellishments from shrink plastic. We still have a DT call at Make My Monday . Why not join in our challenge AND try out for the team? 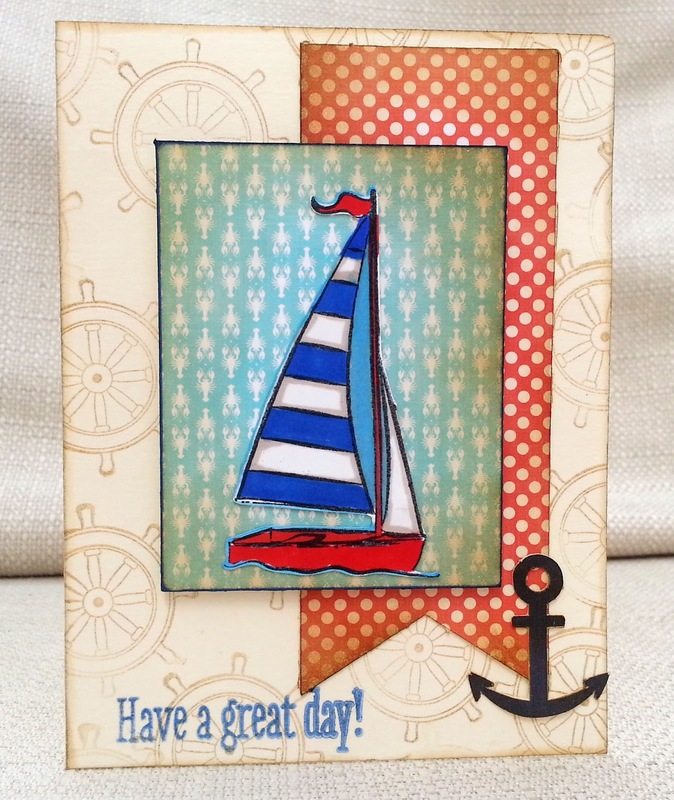 I made this card using two sheets from a Papermania 6x6 paper pack called All Aboard. I cut a square from the lined paper (the 'stain' and black plane were printed on it ) and stamped the earth on it . (It's an old wooden stamp - Rubber Stampede?) . I stamped the paper plane (Lawn Fawn) and trail (Clearly Besotted) , and paper-pieced the plane using other parts of the same lined paper, including the word 'travel', that I popped up on foam for dimension. The ticket/sentiment was cut from the second sheet. I mounted it on red, then cream. Edited to add - While linking this up it occured to me that I may have been subconsciously influenced by Ros Crawford's card which I admired earlier in the week! I didn't realise it while I was making it. Although there are some similarities, hopefully it's different enough so she won't sue me! 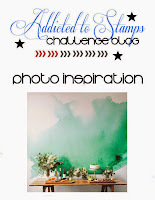 I saw the photo inspiration at Addicted to Stamps and went on a trip down memory lane! That looks like a cheese and wine party! I've never been to a cheese and wine party but I do remember bringing leaflets home from school for parents' cheese and wine parties. It sounded to me like the height of sophistication (although I'm not sure if my parents ever attended). Anyway, creativity being what it is, I subbed a mouse for the cheese and a martini for the wine. 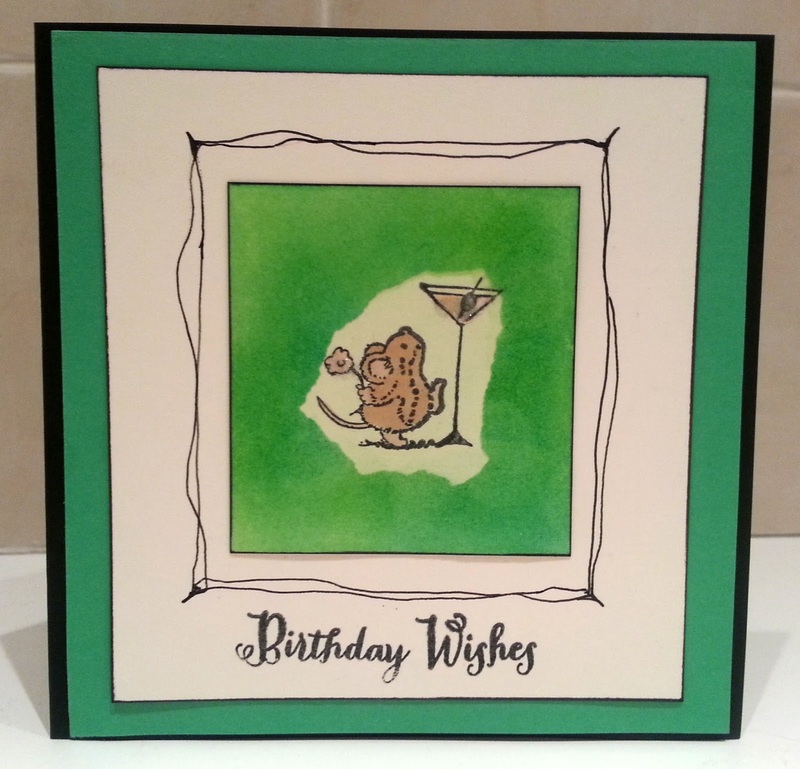 The mouse is a Penny Black stamp, the martini Savvy Stamps and the sentiment is ?? I did masking and inking and doodling and a Wink of Stella on the drink and flower. Note to self - organise cheese and wine party asap. This week's theme at Make My Monday is 'The beach' , and you can see that I've gone down the surfer route. The papers are a digital version of Bo Bunny Barefoot and Bliss. 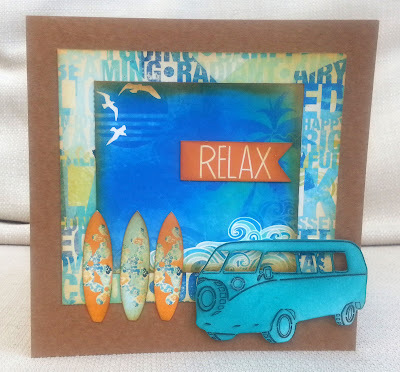 The surfboards are Silhouette cutting files and I created a cutting file from a digistamp of a camper van, which I coloured with ink. We also have a DT call going on at Make My Monday, and I hope you will give it a try by entering the challenge and adding DT after your name. Here I used a stencil and mask I cut out of mylar, using the Silhouette cutting machine. I used texture paste on the birch tree stencil and when it was dry I placed the NOEL as a mask and inked over it with dark blue ink. Then I sprayed it with pearlised water. Then the lid fell off the spray bottle leaving some big smudges of mica. 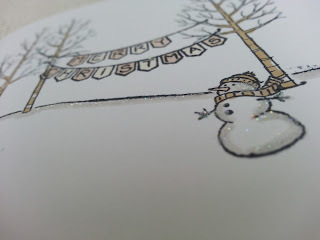 I decided to go with it - it does look less crisp, but can you have too much shimmer on a Christmas card? 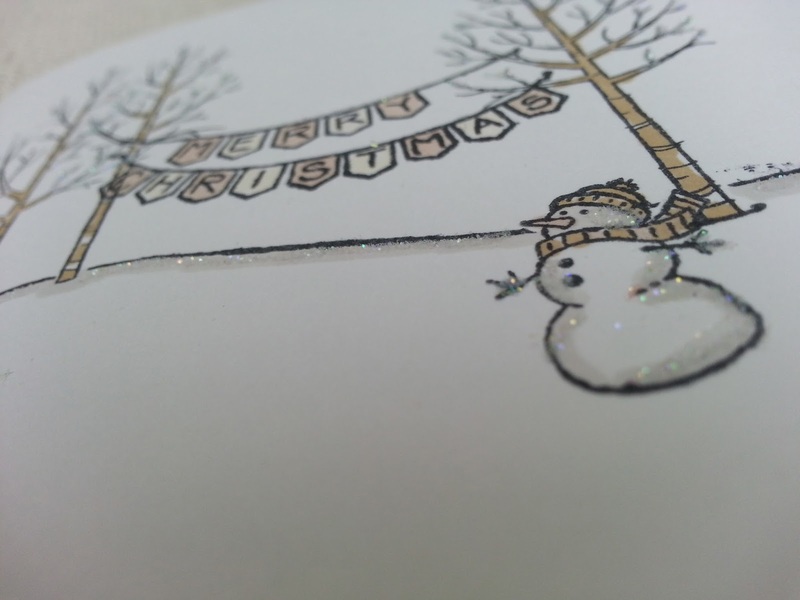 Finally I added some little stars stencilled with silver glitter paste and mounted it onto silver mirror card. I often look at lots of different challenges and let them meld together in my head for a while until they come together in a project. But sometimes I just go off track! Name dropping coming up..... I was in a trendy (or soon to be !) 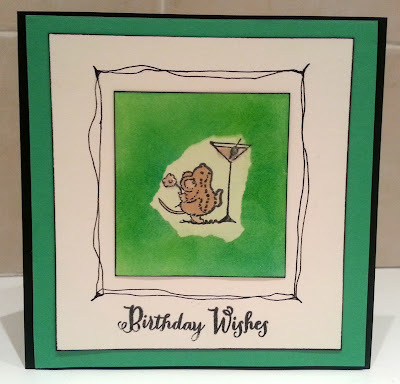 London bar with my glamourous stamping friends Sandie and Nonni and mentioned this card and they pointed out to me that the theme at OLCCC is actually - green! It appears I went off track because I think I was going to combine the OLCCC green challenge with 'trees' at Shopping Our Stash and then got sidetracked. And when I got home and checked, I discovered that the neutrals themed challenge was actually for birthday cards!!! Well, as Nonni pointed out. I can enter my card at OLCCC anyway as the theme is optional, but I had another go at the theme, which I will post separately. So....all the stamps here (except for the sentiment at the bottom) are from a Stampin Up set, and there is loads of glitter on this card. If you are wondering why this is 'take two', please see my previous post. 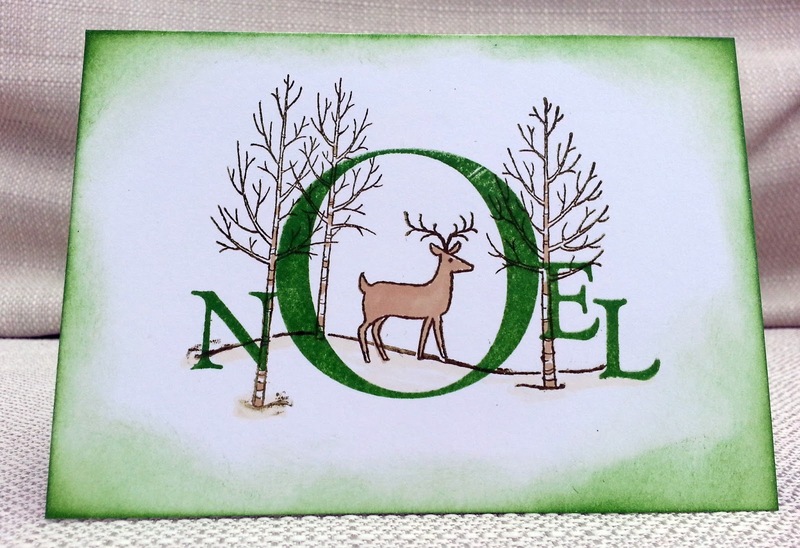 I was determined to make a one layer Christmas card that fits the theme at One Layer Christmas Card Challenge, so I had another go. 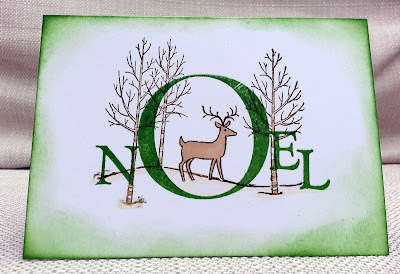 I used the same Stampin Up set that I used in my previous card, together with a Clarity stamp (NOEL) and lots of green ink. 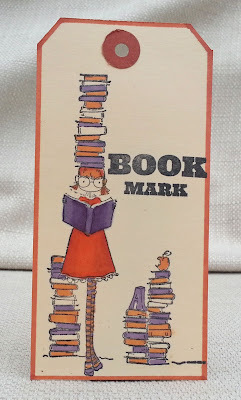 The item that has come out of my box of unused stamps this time is the background stamp (it's stamped twice) which is a JOFY stamp by Paper Artsy. (I think it might actually be from one of the Christmas ranges). 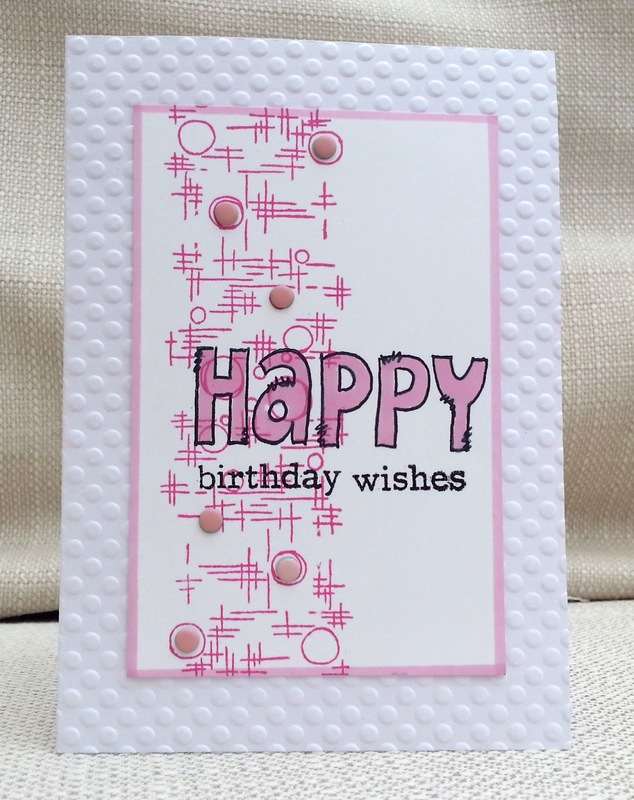 The 'happy' is also by Paper Artsy and the other words are Clearly Besotted. It's only now , while I am posting this that I notice the similarities between this card and my DT card for the current Inkspirational challenge. I made that card weeks ago, and this one yesterday, so I have obviously influenced myself! 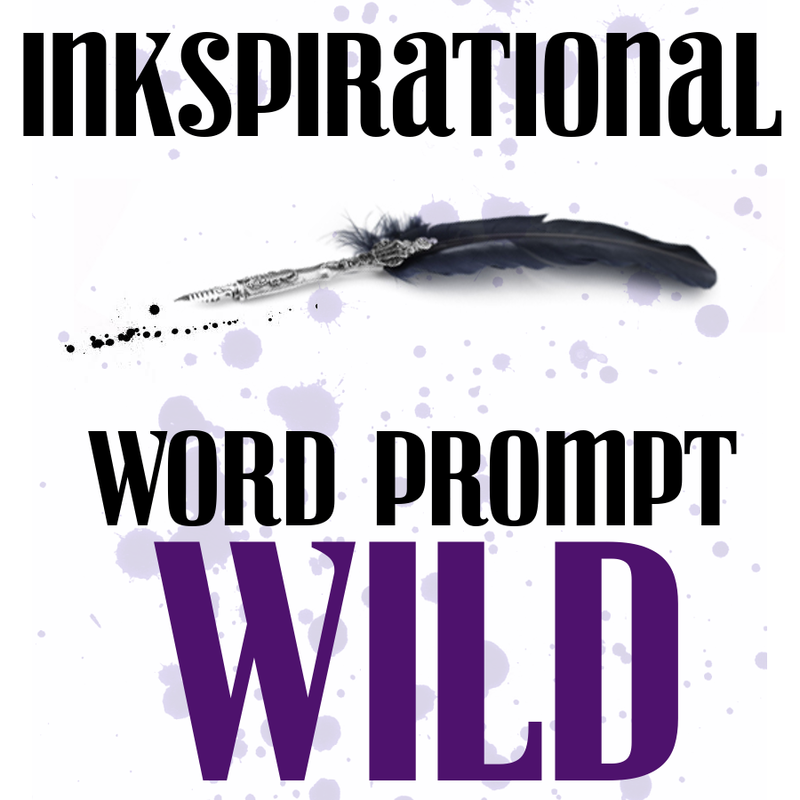 The new challenge at Inkspirational is WILD. For my DT card I used a stamp from one of my oldest sets of clear stamps (they are very yellow!) - I don't know the brand. maybe Woodware? I stamped the pattern twice in a spicy orange colour, so hopefully it looks like a wild animal pattern. 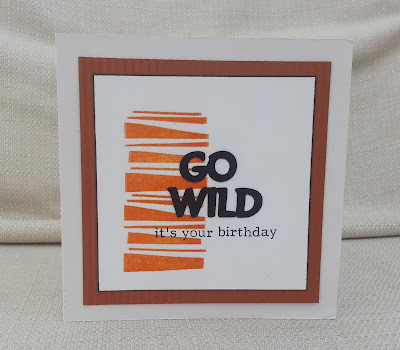 'Go Wild' was cut on my electronic die-cutter from a font on my pc, and 'it's your birthday' is a Clearly Besotted stamp. I mounted it on crimped card. I think this would work well for a man's birthday, don't you? I hope you will come and join in our WILD challenge at Inkspirational . 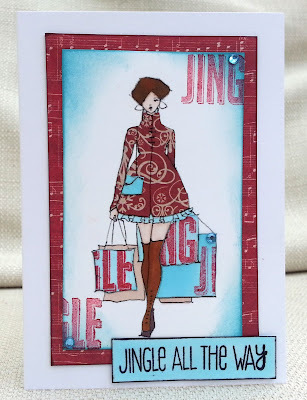 The DT have come up with loads of fun and fabulous interpretations of the theme, and you must see what our wonderful Guest Designer, Jenny has made. We are looking for new Design Team members at Make My Monday. Could you join us? 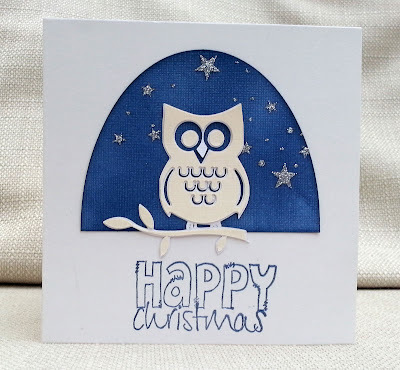 Join in with our current challenge - embossing - and add DT after your name. 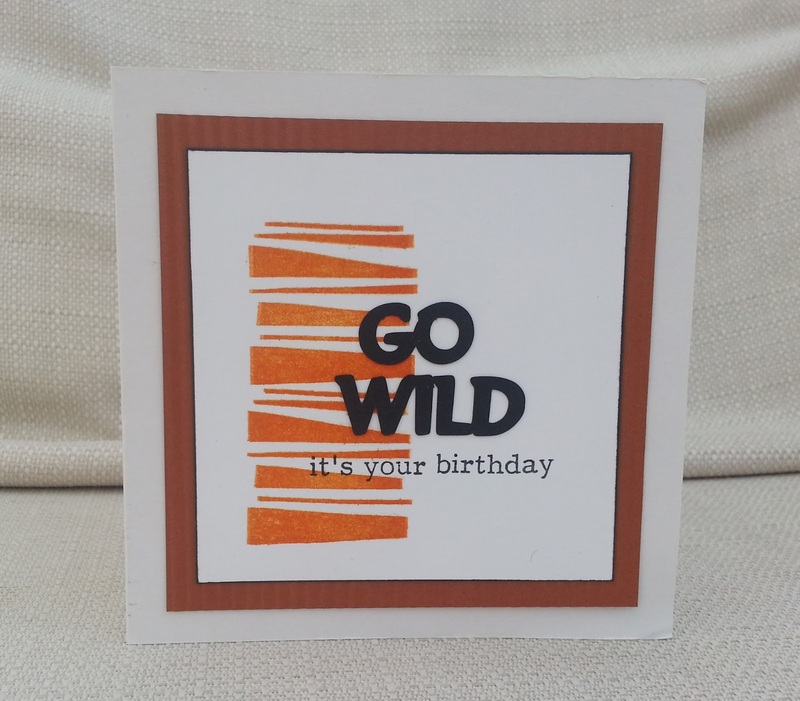 Our theme at Make My Monday this week is embossing - heat or dry. For my DT card I used both. 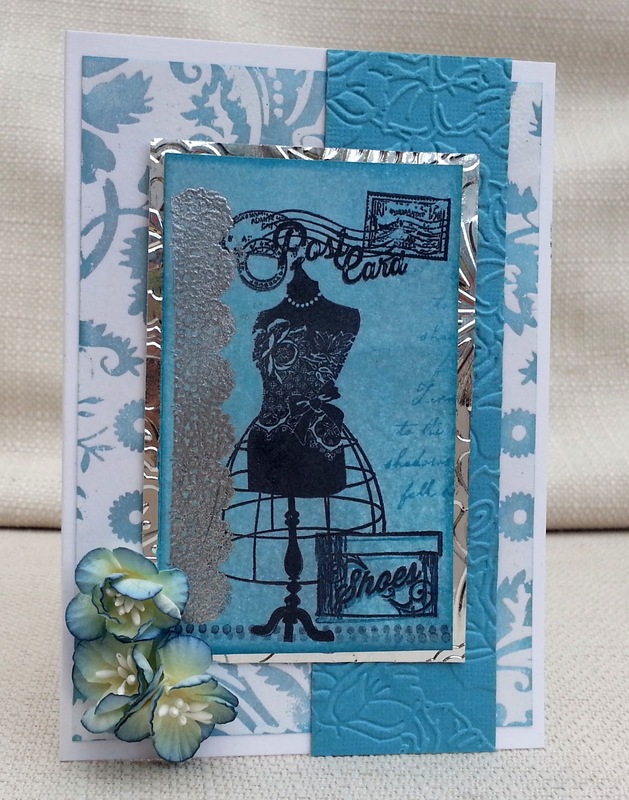 I used two different embosing folders ( on the mirror card and on the blue strip). 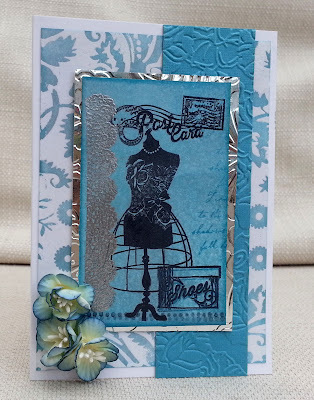 I heat embossed a lace border stamp from the same set as the dressform, postmark and shoebox (more about these later) - these were stamped along with a Paper Artsy script stamp. 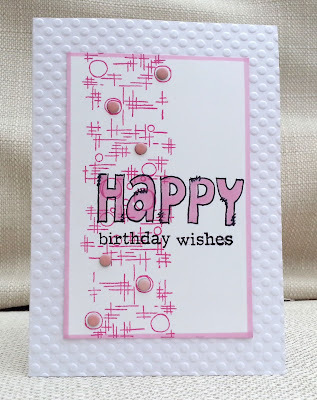 On the bottom layer I clear embossed a Hero Arts background stamp and then coloured it using the embossing as a resist. Now the stamp set I used....it was a magazine freebie, called Jennifer Ellory From Paris with Love, which I pulled from my Empty Box Project box. It may seem a long time since I took anything from my box but in fact I have had several attempts with stamps I just couldn't get to work! Maybe I'll do a catch-up post at some time. 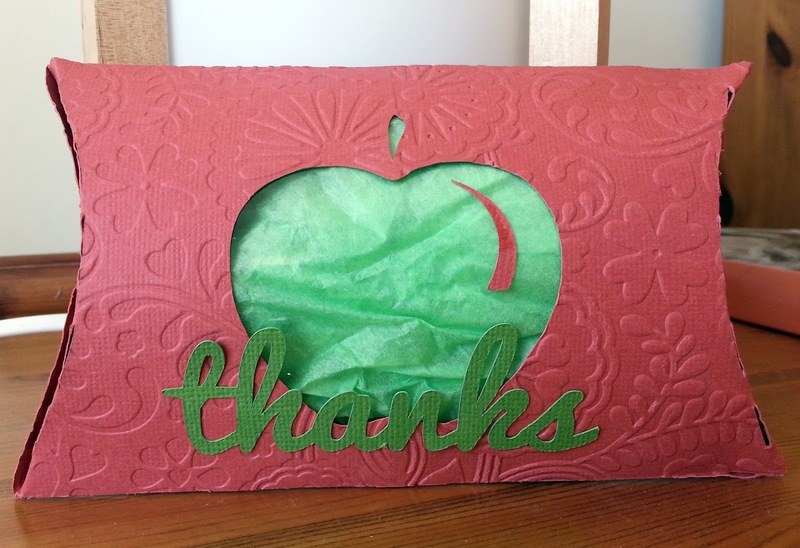 Anyway, we'd love to see your embossed projects at Make My Monday. This Santa is from a stamp set by My Favourite Things. I thought he looked like he's disco-dancing (night fever, night fever-er..) so I decided to put him under a mirrored disco ball. 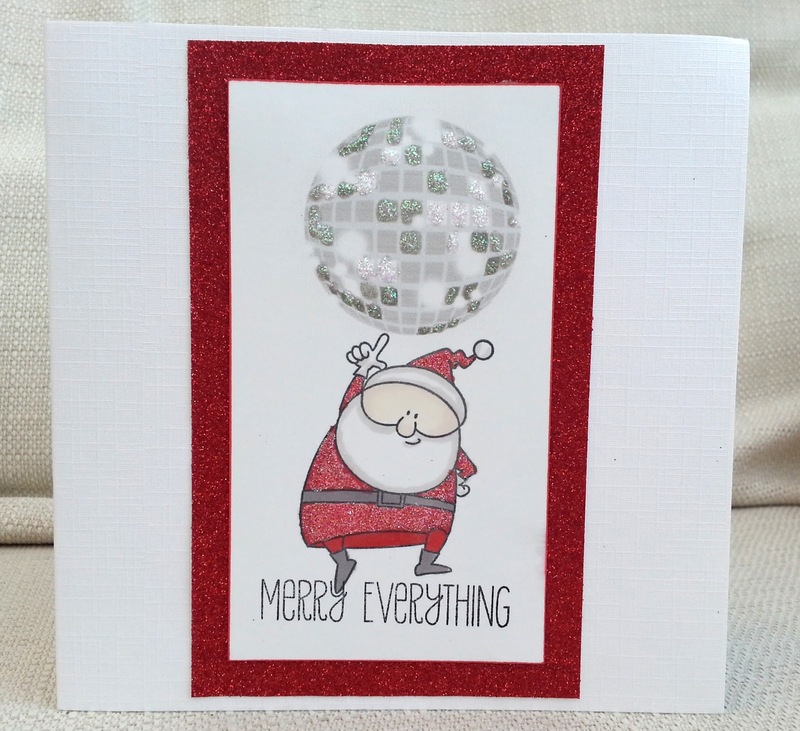 I had to search to find a disco ball and eventually found one on My Craft Studio Crafty Characters CD. I printed it in greyscale and added glitter glue. I stamped Santa and the sentiment, coloured him with Promarkers and then covered his hat ans coat with irrediscent glitter. Then I mounted it all on red glitter paper. 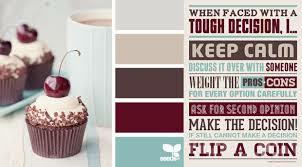 I do find colour swatch challenges difficult. 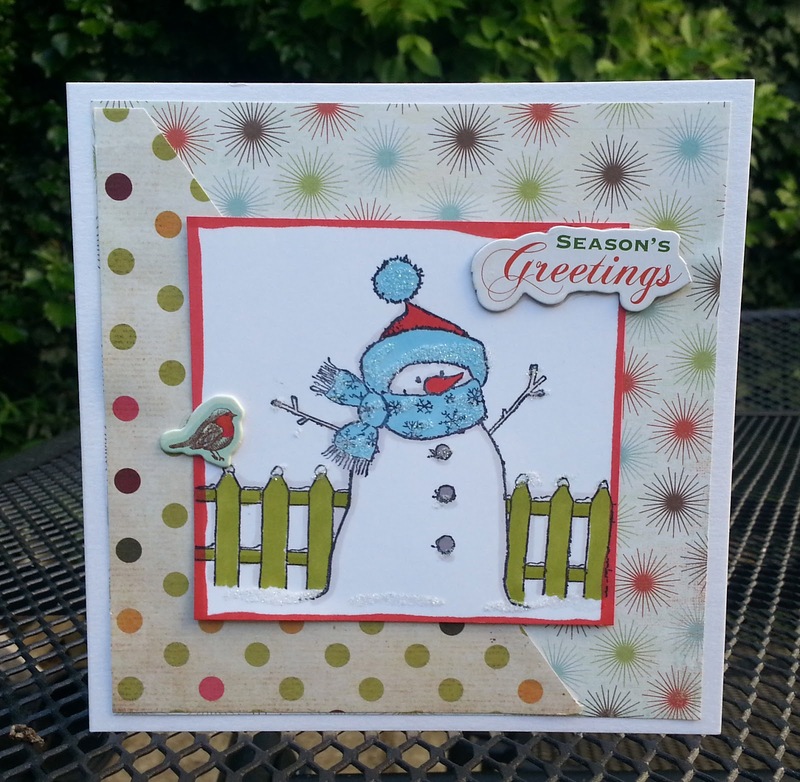 I wanted to try the colour combo for this week's theme at Christmas Card Challenges (see below) . All the time I was making it I thought I was doing it right, but now I see it together with the swatch, I can see the blue's far too bright and the brown too red. Ah well! The image here is an A Day for Daisies digi - I coloured it with alcohol markers and paper pieced her coat and bags. 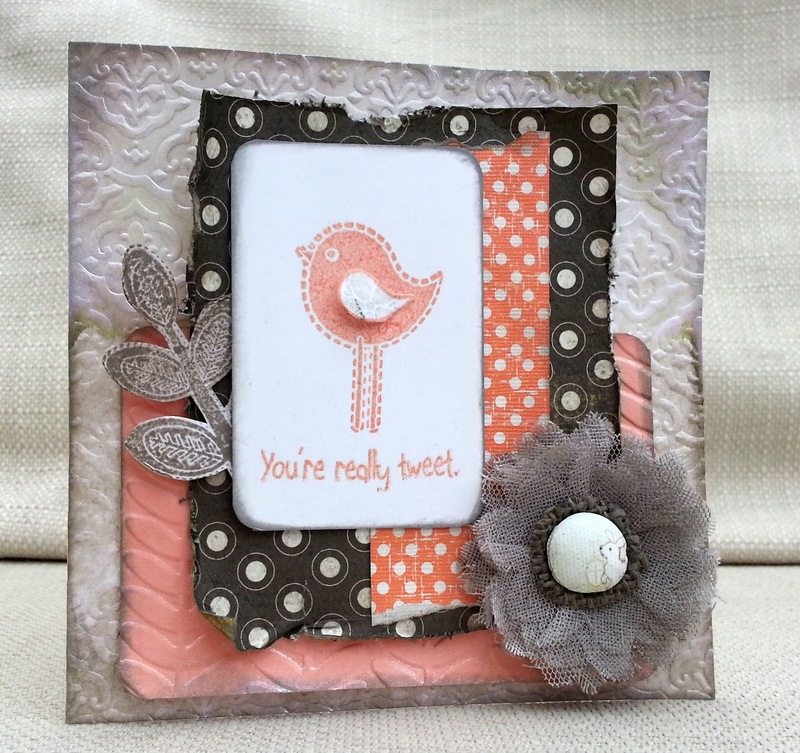 The JINGLE stamp is Pink Paislee and the sentiment is MFT. Recently, I bought a set of Lawn Fawn stamps thinking I would use them a lot, but they're sat on my desk and I have absolutely no idea what to do with them. 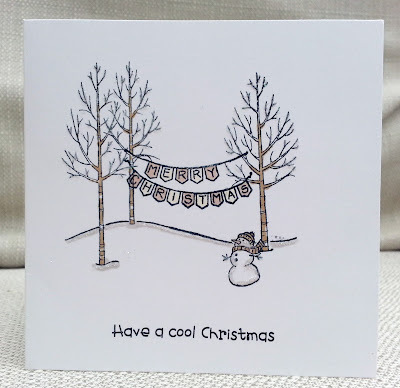 The Stampscapes trees stamp on this card, however, was an impulse buy that I wasn't sure I would use - and I've used it loads. 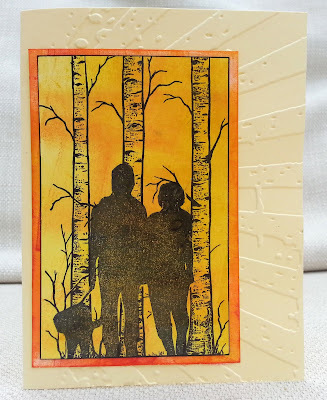 The other stamp, of the couple and the dog, was made using Stamp Material in the Silhouette cutting machine. I cannot remember whether the image was a shape I've bought somewhere, or whether I just traced an image from the internet. 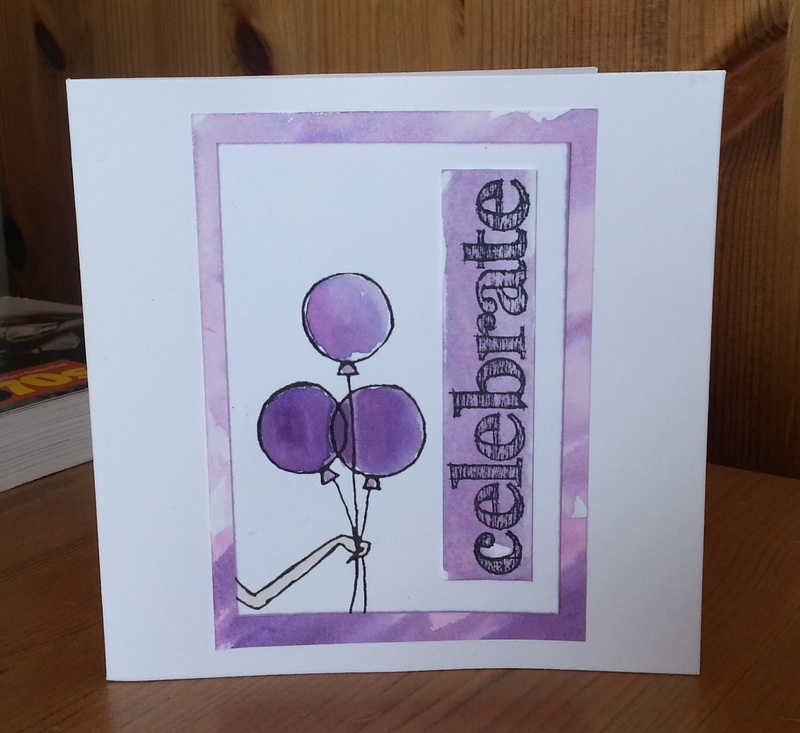 I also use lots of sunshine/sunset colour inks, and a Sizzix /Tim Holtz embossing folder. This owl was cut from cream and white card on my electronic cutting machine. 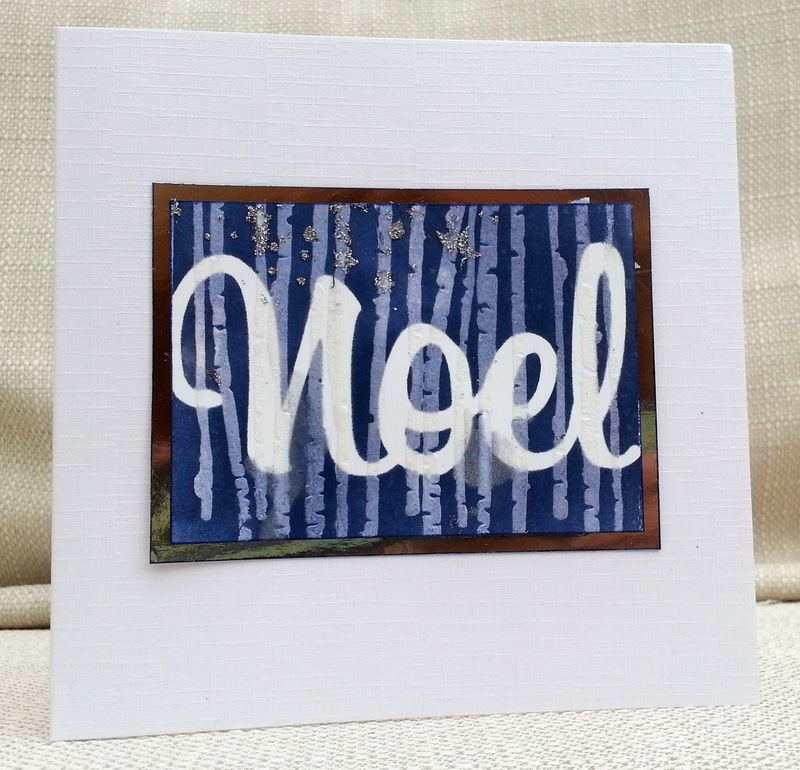 I coloured the semicircle with dark blue ink and stencilled stars in glitter texture paste. I added a little glitter to the leaves. The sentiment stamps are Paper Artsy. 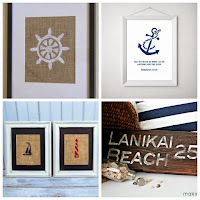 This week's theme at Make My Monday is Shabby Chic. 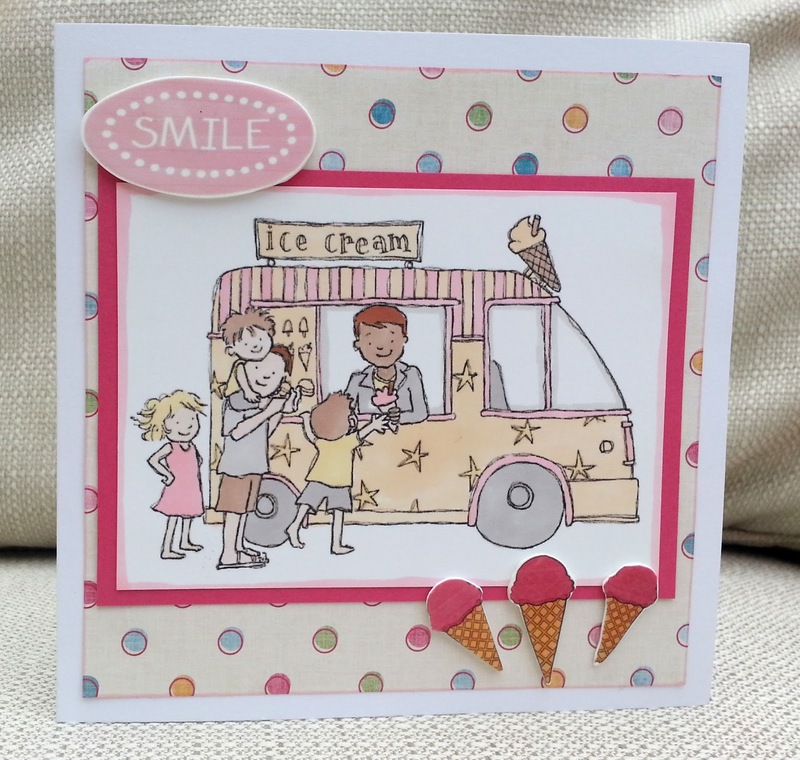 When making my DT card I asked myself 'What is the difference between vintage and shabby chic?'. 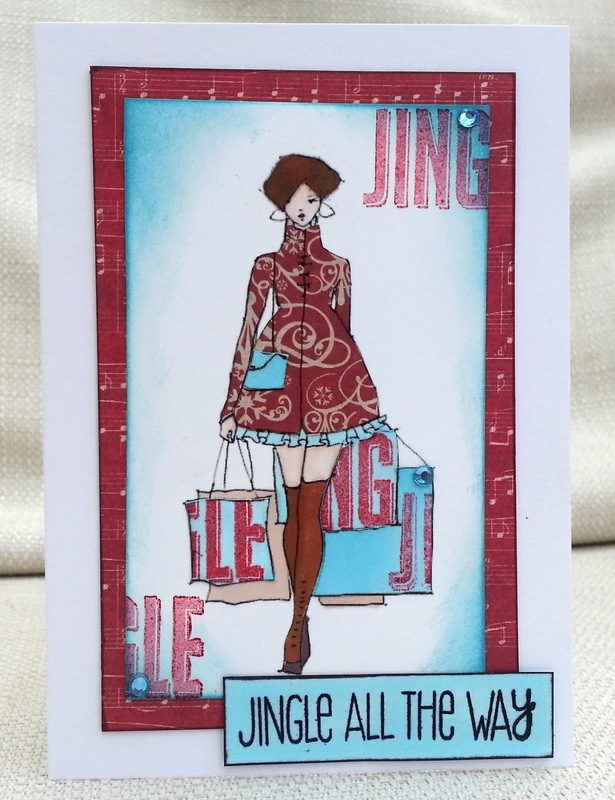 So I tried to make a card that was shabby chic but NOT vintage. If only I would apply my mind to the world's great problems!!! The bird and leaf stamps are Kaisercraft and I used paper scraps, embossing folders, gliding wax (the dirty look on the base card is actually pewter colour wax, Wink of Stella on the wing and a big net flower. When I chose this flower I think I must have been looking at it upside-down or something because I could see it had a bit of a pattern in the middle but I didn't think it was anything in particular. But then I must have accidentally put it on right way up, as I can now clearly see there's a bunny on there! Hope I haven't accidentally made an Easter card! Anyway, hope you will join in at Make My Monday . 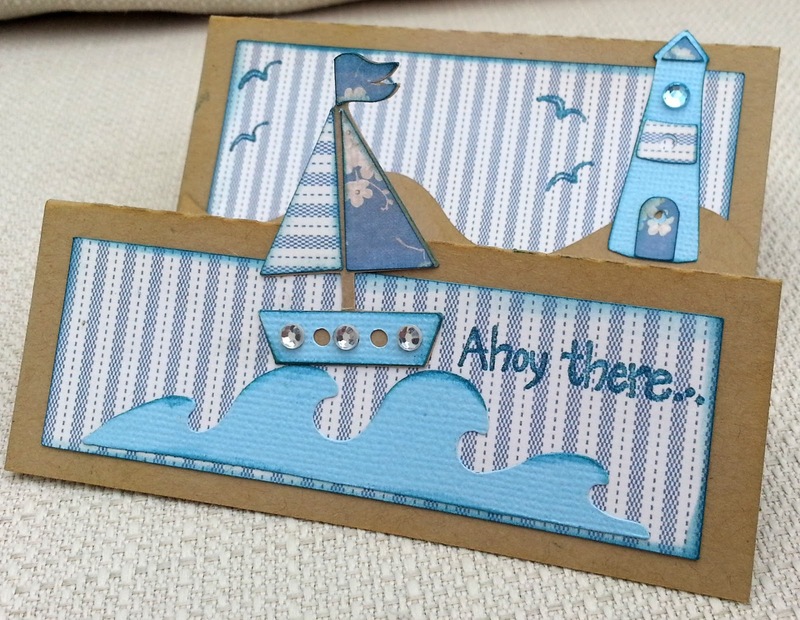 I do love a nautical theme! The boat and ship's wheel stamps were from a magazine and the sentiment is, I think Hero Arts. The papers and anchor are from a Samantha Walker digital collection. I used a stamp from Stamping Bella, coloured with Promarkers , and the words are by Clearly Besotted. 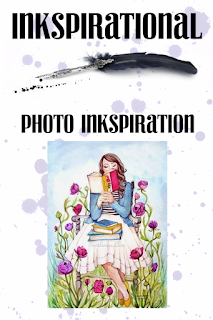 I hope you will visit Inkspirational , see the work of our Design Team and Guest Designer, Kylie, and join in!! This is thoroughly sprinkled with glitter which, of course, doesn't show up in the photo. 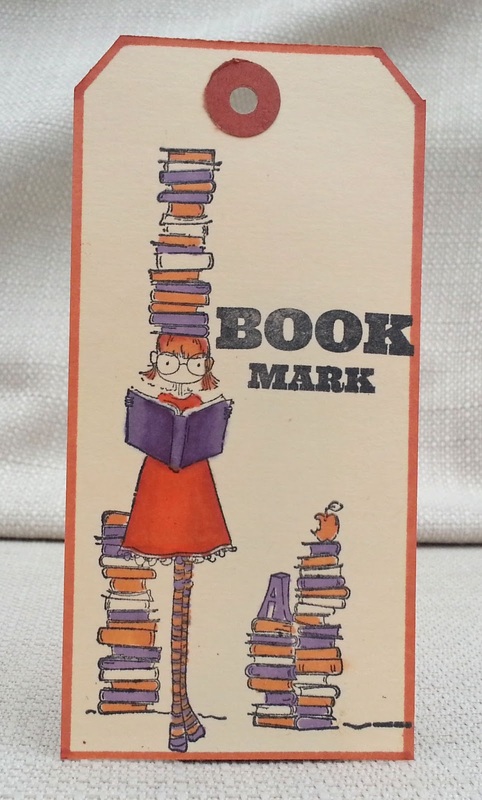 Hobby Art stamp coloured with Promarkers. The papers and robin are a My Mind's Eye free gift with a magazine from a few years ago. The sentiment is chipboard and, I think, another freebie. Over the summer Creative Cutting Challenge is going monthly, and asking people to make anything with a Creative Pointe Cutting File. You can buy them from the online store but there are also freebies available to try. 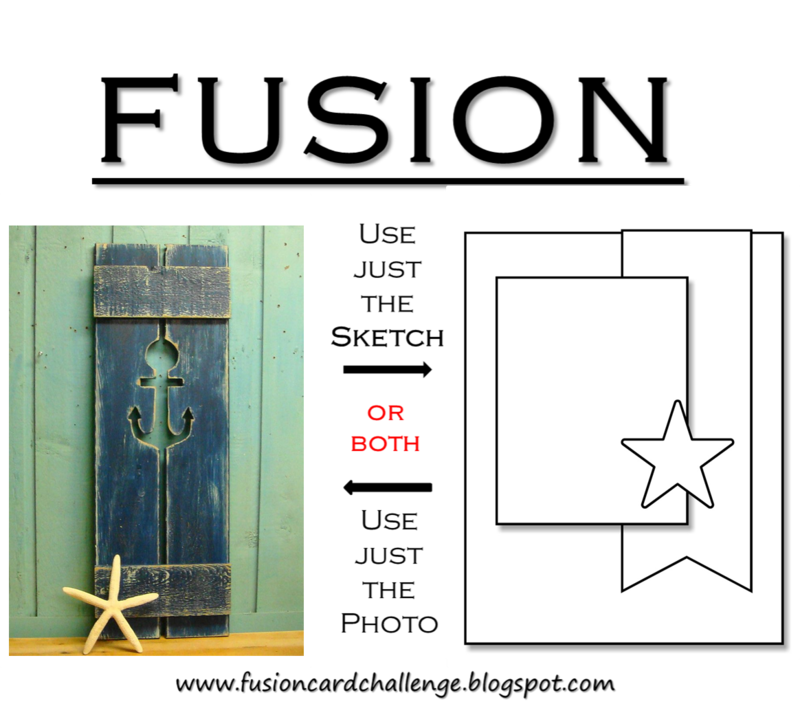 For my DT project I used two Creative Point files : pillow box (so easy to make! ) and the apple from 'school set two'. The sentiment was cut using a font on my computer. For my DT card I printed off an A Day for Daisies image of a woman holding balloons and cropped off everything except one arm! Then I watercoloured it with Twinkling H20s. How does the photo inspire you? I hope you'll join us at Make My Monday .